With December finally here, it means Christmas is officially just around the corner. This week we were contacted by Adam who was in charge of organising his works Christmas party. Adam worked at a manufacturing lab in Flint and told us how each year the lab does something special for Christmas. Usually they would go out for a meal together but this year due to a tight deadline on one of their orders this wasn’t possible, so they had decided to look for a caterer that could come to them and provide a fantastic Christmas meal instead. This was where Hog Roast Flint came in…. Adam stipulated that the meal needed to bring all the festivities and grandeur you would expect from a restaurant around Christmas time so that his colleagues didn’t feel they were missing out. We assured Adam that we could do all that and more and that a Christmas Hog Roast Flint would be like no culinary experience he had had before – it would be miles better! We discussed with Adam the labs needs and discovered there were a couple of people with dietary requirements and some vegetarians. 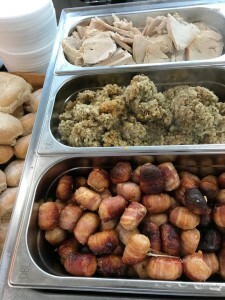 This was no issue for our Hog Roast Flint chef who is a professional at menu creation and was able to design a festive nut roast and vegetable tart for the vegetarians and conjured up some gluten free alternatives where needed. As this was a Christmas party of course we would be cooking a turkey for the guests. People often complain that they aren’t a fan of this meat but when we cook a turkey whole and slow roast it for several hours on our Hog Roast Flint machine, we find that suddenly everyone wants a piece! Along with this we would serve some seasonal vegetables and goose fat roasted potatoes along with some fresh cranberry sauce. Adam was amazed with what we had come up with and said he and his colleagues in the lab couldn’t wait to try it!